This week official preview images emerged of the forthcoming collaboration from Nike and Undefeated as the parties continue their relationship with two limited edition Lunar Force 1s. 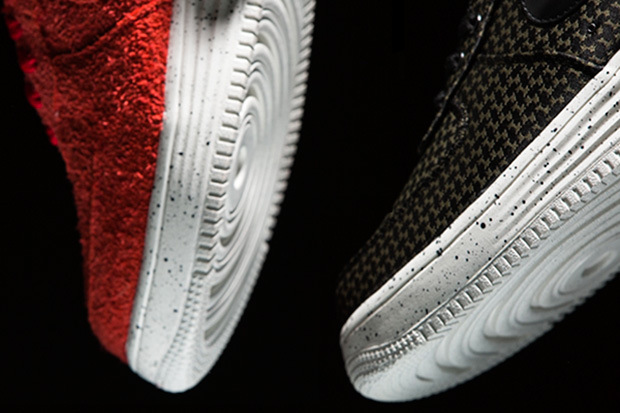 The new release includes a red hairy suede Lunar Force 1 High and a dogtooth style Lunar Force 1 Low, both with white speckled sole units. Nike and Undefeated have together produced some of the most collectable sneakers of all time and although the latest might not meet the same hype as the ‘Bring Back Pack’ from last year, these will be snapped up quickly. The two Undefeated x Nike Lunar Force 1s are set to release this Friday February 28th at select stockists globally, including Nike 1948 in London. Expect more images very soon.